This gas scene is a great throwback to the KO scenes from the 60's. 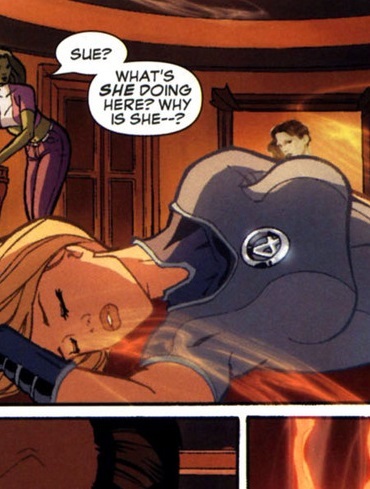 Sue Storm is silently invisible in the background, but the gas KO's her. The gas also KO's She-Hulk. In the last panel, Sue Storm mentions that she's been gassed so many times! Dec 25, 2008 11:20 AM: Placed on Featured List. Dec 25, 2008 11:20 AM: Scene released. Yeah, the subtle reference to her previous gas scenes was a nice touch. This was a really good modern scene in it's own right, a rare find. This is that rare scene where the dialogue is even better then the KO.